In its 13th year, ROMP is the main fundraising event for the International Bluegrass Music Museum. 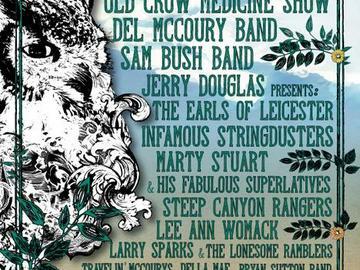 The festival features artists from the roots and branches of bluegrass and is located in Owensboro, Kentucky. Yellow Creek Park is the beautiful venue of ROMP, offering amazing camping areas. Join us on June 22-25th for ROMP 2016! WELCOME TO THE TICKETING HOME OF ROMP 2016! ROMP Tickets will be available for you to download and print once you complete your purchase, and will also be emailed to you. Please be sure to print the tickets and bring them with you to the festival. Tent camping fee of $15/person covers the entire weekend. RV Camping covers all types of campers in which you will be sleeping. This includes, but is not limited to RV's, campers, trailers, buses, motorhomes, etc. This DOES NOT include electricity or water. RV Camping pass only covers the first two attendees camping in the RV. Additional individual camping passes will need to be purchased if you have more than two occupants in your RV. RV Campers can enter the park on Wednesday, June 22nd at 8am. This is for RV campers only. Tent Campers can enter the park on Wednesday, June 22nd at 10am. All ROMP attendees will need to exit the park no later than 10 am on Sunday, June 26, 2016. We want you to have a great time at this event but remember: No Alcohol, Illegal Substances, or Weapons. All Events go on as scheduled, RAIN OR SHINE. No Smoking except in designated areas.